Recommended to: Readers looking for a zombie apocalypse story that has its own unique twists and turns. Imagine finding your first love, only to be ripped apart by the apocalypse. Peyton Anderson will never forget the day she was forced to make a choice--between her family--and Chris Parker, the boy she'd given her heart. Now, four years later, as she steps from the fallout shelter and into a dead and broken world, he's the only thing on her mind. Now the two of them have been thrown together once again, reluctant chaperones to a group of orphan children in a post-apocalyptic world where the dead still walk...and feed. As they begin their pilgramage to the last human outpost on Earth, can they find a way to let go of old hurts and find the love they lost--all while attempting to save what's left of the human race? 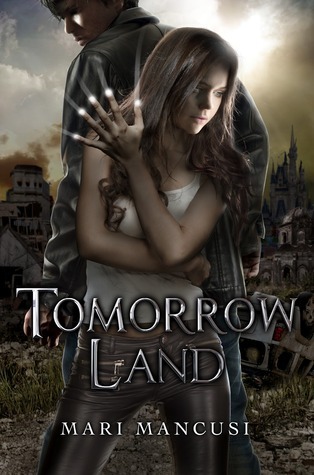 Tomorrow Land follows the lives of Peyton Anderson, a girl who has been trained to survive the impossible. A true "razor girl" Peyton is definitely the type of character that you wouldn't want to mess with. She's strong, she's tough, and she knows how to make things go her way if need be. Chris Parker is the other main character here. A sweet, kind boy who is trying to figure out his feelings for Peyton. The two of them set off on a wild ride, chaperoning a group of kids in an attempt to find safety from the walking dead. That? That's the book in a nutshell. No kidding! The cover really does do the book justice, since the book centers around Peyton, her knife infused hands, and kicking some walking dead behind. I did like that Mancusi was very factual when she created the disease that ended the world. Since I'm already a fan of her writing style, I enjoyed seeing more of that in this book as well. However what really put me off more than anything were the copious amount of pop culture references. In all honesty, I like Mancusi's other series much better. The pacing was a bit off. There is an unnatural clumping of events which makes the first third of the book slow, the middle amazing, and the end slow again.. For a group of kids wandering across a zombie infested wasteland, nothing much seems to happen. There are a few fight scenes, but again they are rather spaced out. On top of that the romance was aggravating for me. There is a lot of angst, random arguments, and even the times when they are being sweet to one another don't seem real at all. If it had simply been left out, I really think it wouldn't have mattered. Chris is sweet, but he's just not Peyton's kind of guy. At the end of the day, Tomorrow Land was what I expected but didn't really deliver everything I hoped for. I love Mari Mancusi's writing as a general rule, I think that this particular book was just a miss for me. If you enjoy books that deal with a zombie infested apocalypse, this is one you might want to give a shot. Otherwise I'd highly recommend you check out Mancusi's other series as well!